After 30 years in the garden centre business (I'm only counting adulthood here), climate change seems very real to me. So if we can't rely on the calendar anymore - how do we know when it's time to plant? How do we know when it's safe to put away the frost blankets and get on with the (very short) spring selling season? Phenology - Everything old is new again! Phenology is the study of periodic plant and animal life cycle events and how these are influenced by seasonal and inter-annual variations in climate, as well as habitat factors (such as elevation). With the climate in flux, it seems like a good idea to watch the plants around us for signals. After all, plants have to adapt to their circumstances - if they change their behavior, we should take note. Climate Zone Maps are well and good, but we all know how our local microclimate plays an important role too. I've noticed that the bloom phase of the Redbud (Cercis canadensis) is really good indicator of season-shifting here where I am in the Golden Horseshoe at the west end of Lake Ontario. Note: don't rely on the Redbud in a container in your nursery yard - those will be ahead of time because the (black) above ground container their planted in warms the roots prematurely - watch Redbuds that have been planted for a number of years. Redbud in Full Bloom - it's almost time to plant tender plants (annuals, vegetable seedlings). And, the Morel Season Begins! Redbud blooms fall and the leaves begin to emerge - the risk of frost has passed, plant fearlessly. So where did I find this delicious little fungi (Morchella esculenta - Yellow Morel)? Tromping through the woods perhaps? Nope - it was under the branches of the Redbud in the picture, 2 feet from the sidewalk - in the Junction neighbourhood of Toronto, . And there were a dozen more within reach of this one. Yum - a little butter, a little salt and pepper in a frying pan - it's good to watch for the signs of spring! 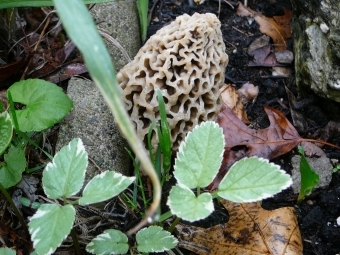 The appearance of Mushrooms like the Morel, means that soils are warmed-up for the growing season.